"The Dan Patrick Show,” is simulcast on DTH satellite service DirecTV and broadcast across the country using AoIP technology. Amidst swirling competition and a need for new revenue, radio personalities have expanded their audiences and their reach by installing video cameras in their studios and broadcasting from remote sites related to their genre’s scope. This has been particularly true of sports talk radio shows, which use major sporting and entertainment events to draw their listeners in. They have also invested heavily in live remotes to attract attention. However, to produce such shows away from their home studios, and do this effectively, they need a reliable two-way production crew communications infrastructure that can connect the different locations and keep them in sync for the entire broadcast. Should the on-air talent move out of the TV frame or if the director or producer needs to inform the talent of an upcoming segment or the availability of a new piece of audio or video that needs to be included, they receive such instructions via an IFB system connected to their headphone. They might want to hear the on-air program in one ear and the producer in the other. That’s what keeps a show running smoothly—and at an even audio level, despite the intermixing of multiple sources and live listener call-ins. In the past this has been a complex and labor-intensive undertaking that required large amounts of cabling and field-proven engineering expertise to make it all work. Today, that infrastructure is taking advantage of the public Internet and the latest audio-over IP (AoIP) networking technologies to move audio and video signals around town (and across the country). Dedicated fiber-optic lines have also become part of the audio-video equation. As a veteran radio engineer and owner of systems integrator Pacific Mobile Recorders And Studio Builders—located in Sacramento, California—Jim Hibbard understands the advantages of AoIP workflows as well as anybody and uses them regularly to help major broadcast clients like the AT&T Original Content Group built new remote broadcast facilities. This allows daily shows in remote “permanent” locations to run as if they were just down the hall. They have also developed flight packs to take the shows on the road with all of the bells and whistles that the talent, producers, and directors enjoy at home, and added a Wheatstone LXE console with motorized faders to a new Flight Pack, which allows unlimited flexibility and capability. DirecTV colleague Alan Guzzy (left) and Hibbard prepare for a live radio remote broadcast. Perhaps the biggest advantage, he said, is that he can now establish a network switch on two ends of a 300-foot piece of coax cable and move a lot of audio signals across it. And now, many of our switches have fiber interfaces, allowing us to use military-grade tactical fiber to connect switches over even greater distances with more reliability. If he adds the Internet between different locations, he can set up a totally secure network, regardless of the distance between them, and it’s relatively easy to do. Hibbard also serves as director of radio engineering for “The Dan Patrick Show,” a popular weekday radio talk show that is simulcast on DTH satellite service DirecTV. While the show is based in Milford, Connecticut, he’s using this AoIP approach to facilitate the show on a daily basis since the actual television broadcast facility is in Marina Del Rey, California. This AoIP approach also gives them full capabilities on live remote broadcasts from locations like Minneapolis, Minn. and Pebble Beach, California, where the show has leveraged some of the sports world’s largest events to its financial and audience retention advantage. The level of a Wheatstone E-6 Series console can be adjusted remotely over IP via the WheatNet-IP system and Glass E networking software. In fact, Hibbard set up a complex AoIP system that included reliable two-way IFB between producer/talent/director in three geographic locations, getting phone calls and bumper music from the show’s studio in Milford to the talent at the remote site, and handing off audio to the show’s syndicator, Premiere Radio Networks, as well as to its television producer, the DirecTV Audience Network. The show is also seen on the NBC Sports Network. Using bidirectional IP audio and communications technology from a company called Tieline Technology, Hibbard can move crew communications signals between each remote site. Most times three or four disparately located sites are tightly networked to effectively extend the signals generated from a ClearCom intercom system at both ends across the country. The WheatNet-IP system is carried on the road in a flyway kit for live remote broadcasts. Hibbard can dial into the WheatNet-IP system and look at the system performance from anywhere in the world. 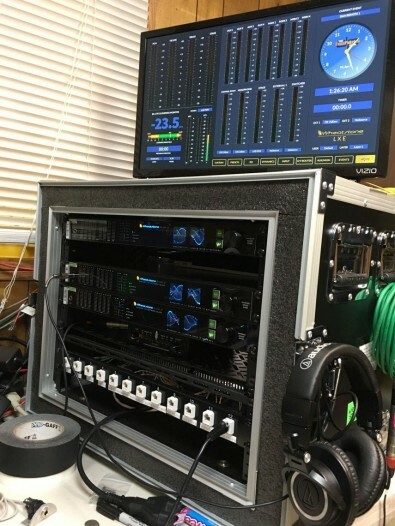 He also uses the WheatNet-IP network system from audio technology supplier Wheatstone to leverage these IP-based comms signals and distribute them via a series of mic preamps and E-1 Series, E-6 Series and LXE radio mixing consoles (also from Wheatstone) at each end. This enables all audio sources to be available to all devices (such as mixing consoles, control surfaces, software controllers, automation devices, etc.) on a network and controlled from any and all devices. WheatNet-IP, which is AES67 (AoIP networking) compatible, also allows Hibbard to monitor and control audio levels from anywhere he can get Internet access. 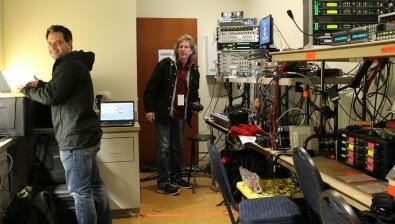 The WheatNet system provided individual talkback signals for everyone on the crew as well as for Dan Patrick. The guys in the crew could push a button on their Wheatstone TS-4 Talent Station units (which provide lighted on/off/cough and talkback switches for Patrick’s and other talent’s microphones) and talk directly to Patrick (in his left ear) or have a two-way, partyline chat with the crew (in any location) in both ears. In addition, the WheatNet-IP system features a series of individual blades (or I/O access units) with a CPU on each that can be hot swapped “in about six minutes,” Hibbard said, or enough time for a station break, should one fail during a broadcast. This gives him complete redundancy. Hibbard’s typical live remote setup for DirecTV SportsNet. Hibbard can also dial into the WheatNet-IP system and look at the system performance from anywhere in the world, using another Wheatstone networking software technology called Glass E. This is a virtual mixer that allows him to pick an individual console—based on a unique IP address—and remotely adjust faders and busses on the console without physically being there. The physical faders on the console don’t move, but he can adjust the levels internally. The Glass E software can also be used in place of a physical console when necessary (saving cost and also space if needed for an extra control surface). Leveraging all of AoIP’s inherent benefits—complete flexibility in signal distribution and the ability to produce a show from literally anywhere in the world—is clearly enabling many more opportunities for radio and TV stations to go where the audience is. In addition, Ethernet (IP) can carry huge amounts of audio-as-data while requiring much less cabling and infrastructure than other methods of studio interconnection. Add a software layer for remote IP-based monitoring and control and, for guys like Hibbard, that’s a win-win for everyone involved.